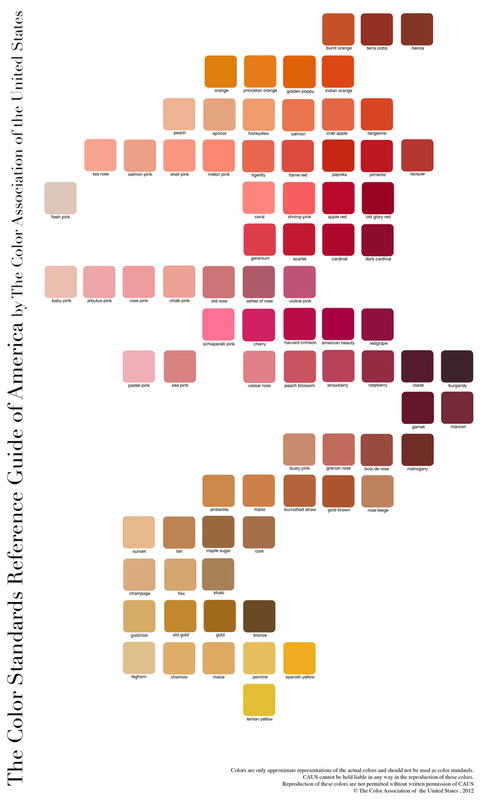 The Standard Color Reference of America was issued in 1915 for the purpose of simplifying color work by standardizing color for the U.S. The card offers a palette for color choice and at the same time helps to facilitate the selection of colors. Primarily directed to the textile, fashion and environmental industries. It can be effectively used by everyone who has the responsibility of matching and combining colors. There are 16 pages of 12 colors each in the 10th Edition. Each page offers a series of harmonious color combinations whether by color pairing or by groups. The Standard Color reference is a supplemented by a special U.S. Army Color Card showing, in silk ribbon form, the key shades of the U.S. Armed Forces, which are approved and accepted by the Quartermaster General. 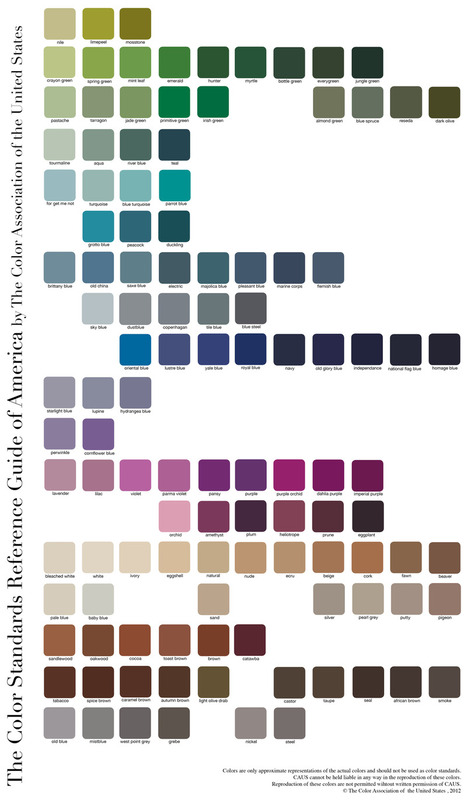 Like previously published editions, the new 1981 Standard reference presents a comprehensive palette for color choice and is a help to facilitate the selection and coordination of shades. It is primarily directed to the fashion, textile and environmental industries. Note that the standard name or standard number will always signify the color so designated in this card. The names which have been adopted are purely descriptive and to be used only in such manner. In order to facilitate choice and coordination of colors, the pure silk samples have been arranged to afford the user a medium to visualize both the highlights and low-lights of each color. Therefore, when matching to a brilliant shiny surface use the satin side of the fabric; when matching to a dull surface use the flat side of the fabric. The liability of the Association, for any errors or omissions in the printing, preparation or distribution of this reference card, or for any other cause, is limited to the cost of the card. We therefore advise our Members and others users to specify the editions number of the Standard Card from which the color has been selected. 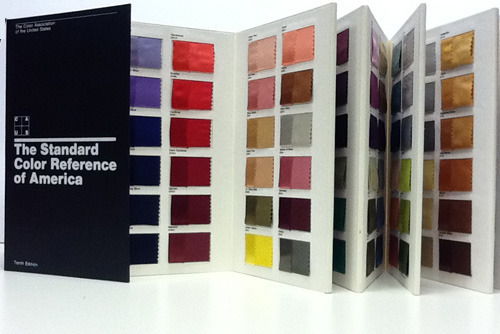 In addition to the Standard Card Reference, the Association also issues cards, each Spring and Fall, forecasting seasonal fashion colors which are the recommendation of the Association, selected by Committee members with specialized experience in the woman’s, men’s, and home furnishings industries. 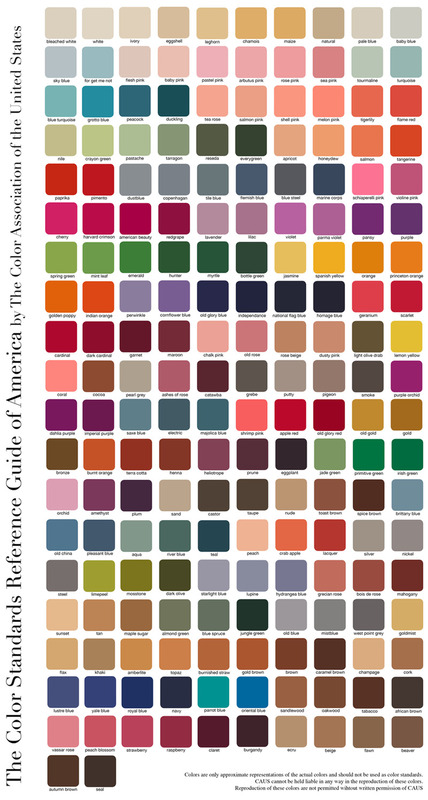 The following color chart represents the 191 colors from the 10th edition. Color names and cable numbers from previous editions may differ from the 10th edition. Please see table below for cross reference from 10th edition to the 9th edition. Colors are only approximate representations of the actual colors and should not be used as color standards. CAUS cannot be held liable in any way in the reproduction of these colors. Reproduction of these colors are not permitted without written permission of CAUS.